Game features modding support and source code is available. To disable Steam, use Open Source Edition. Has many enhancements compared to the official version (gameplay and stability fixes, better controller and resolution support, positional sound, online mod downloader, etc.). Unofficial update packs are available on the game's forum. Works with every sold version of the game, however with the Steam version, Steamworks is completely disabled. Defaults are stored in default-1.xml and if config file is removed, user is prompted with configuration utility when starting the game. 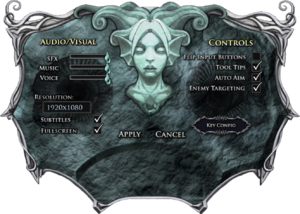 External options menu. Launched if configuration file is missing or corrupted or directly opened from <path-to-game>\AQConfig.exe. 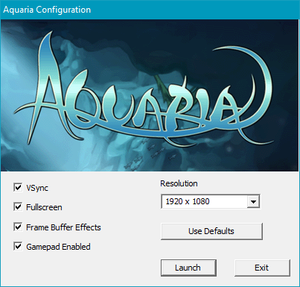 May require AquariaOSE for higher than 1920x1080. Keyboard and mouse controls get partially disabled if controller is enabled from configuration. Controller has to be enabled from configuration before being used. Configuration requires mouse or keyboard. Actions cannot be bound to D-pad nor axis. With XInput controllers, this also means triggers becoming unuseable. Only in rebinding window. 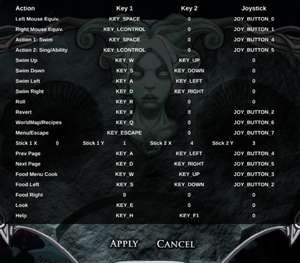 Game only shows keyboard and mouse prompts and tutorials. SDL2 Officially Linux only. Also Open source edition. 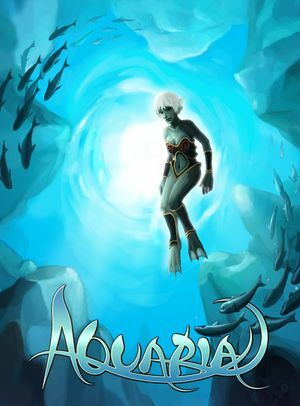 System requirements do have slight differences: Official FAQ (Windows, OS X), Steam (Windows), GOG.com (Windows, OS X, Linux). libc6:i386, libasound2:i386, libasound2-data:i386, libasound2-plugins:i386 and dependencies.